'There was a hand in the darkness, and it held a knife.' Nobody Owens, known as Bod, is a normal boy. He would be completely normal if he didn't live in a graveyard, being raised by ghosts, with a guardian who belongs to neither the world of the living nor the dead. There are adventures in the graveyard for a boy - an ancient Indigo Man, a gateway to the abandoned city of ghouls, the strange and terrible Sleer. But if Bod leaves the graveyard, he will be in danger from the man Jack - who has already killed Bod's family. 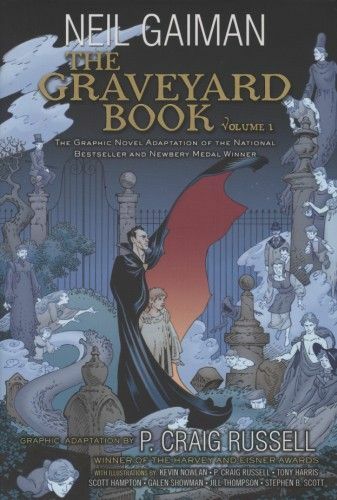 Neil Gaiman's Newbery Medal-winning The Graveyard Book reaches new heights in this glorious adaptation by P. Craig Russell. Each chapter is illustrated by a different luminary from the comic book world, including Kevin Nowlan, P. Craig Russell, Tony Harris, Scott Hampton, Galen Showman, Jill Thompson, and Stephen B. Scott, to create an imaginatively diverse and yet cohesive interpretation of Neil Gaiman's luminous novel. Diesen Artikel haben wir am 06.08.2014 in unseren Katalog aufgenommen.